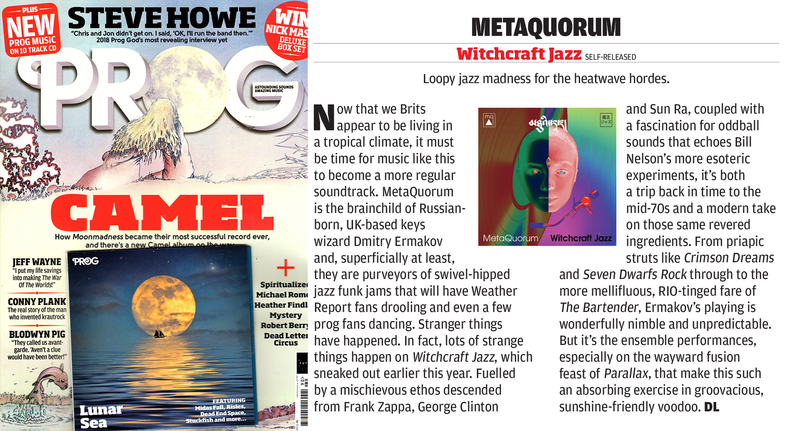 Andrew Howlie of The Pop Break gave Witchcraft Jazz 10 out of 10. This bunch are based in the north-east but have a truly international feel and are led by Dmitry Ermakov, a Russian born composer and keyboardist. They take great delight in seeking out the boundaries of jazz, electronica, funk and prog and then gleefully mangling them, resulting in a release that sounds like it should be soundtracking a cool crime drama that is being broadcast on one of the moons of Saturn. It’s discordant, occasionally daffy but always lands on the right side of interesting. 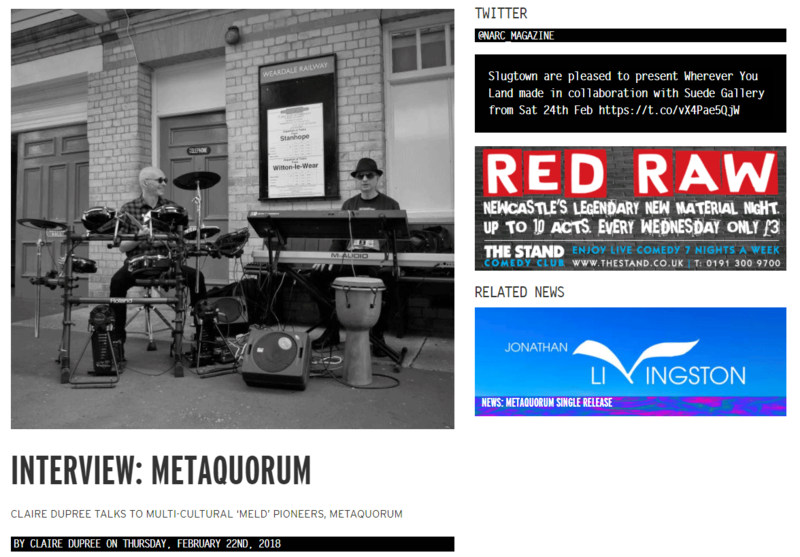 UK based duo MetaQuorum recently released two new singles which are available on Bandcamp. 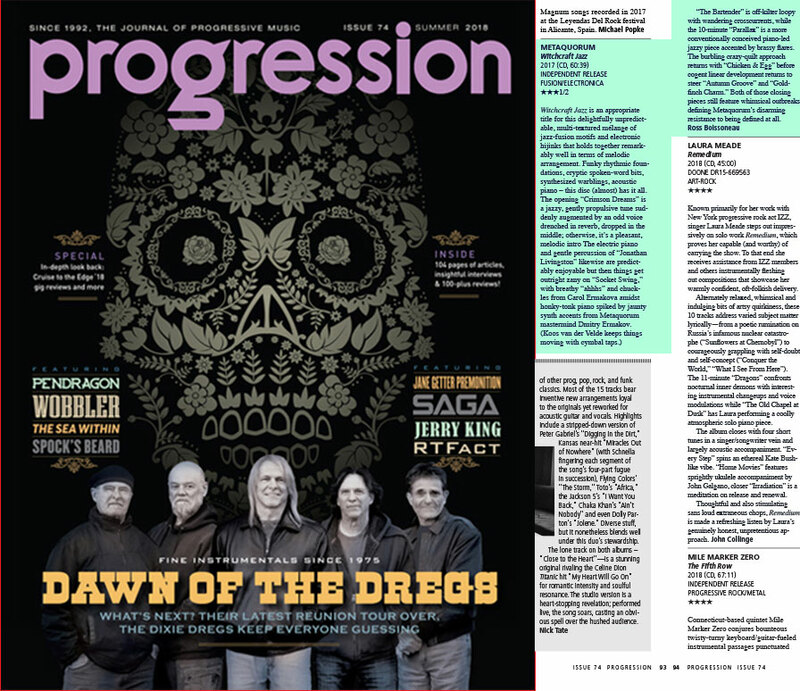 In an interview for Prog Sphere, Dmitry Ermakov and Koos van der Velde talk about the band’s work. Define the mission of MetaQuorum. To have fun and continue on our music journey. To contribute to the revival and emergence of new Progressive Music styles and to continue developing our own Meld music by experimenting with a fusion of different genres. To bring out Meld, a new wave of Progressive Music, both instrumental and songs, to all generations of music-lovers. To help in shifting the balance in the general population’s preferences from ‘dumb’ music dominating radio waves and… well, TV, Net etc. towards ‘intelligent’ music of any kind. “A duo from the the North of England who delight in the unusual, MetaQuorumare an act who blend several genres to create something very different from the norm. …the album sees the pair pulling together electronic production techniques, sampling, a funk groove and an “alternative” mindset to create instrumentals which boggle the brain. Like the single below, which feeds off the bleak but oddly beautiful surroundings on the North East, each track has a specific inspiration – one idea which then develops into the sprawling tracks that personify the whole release. 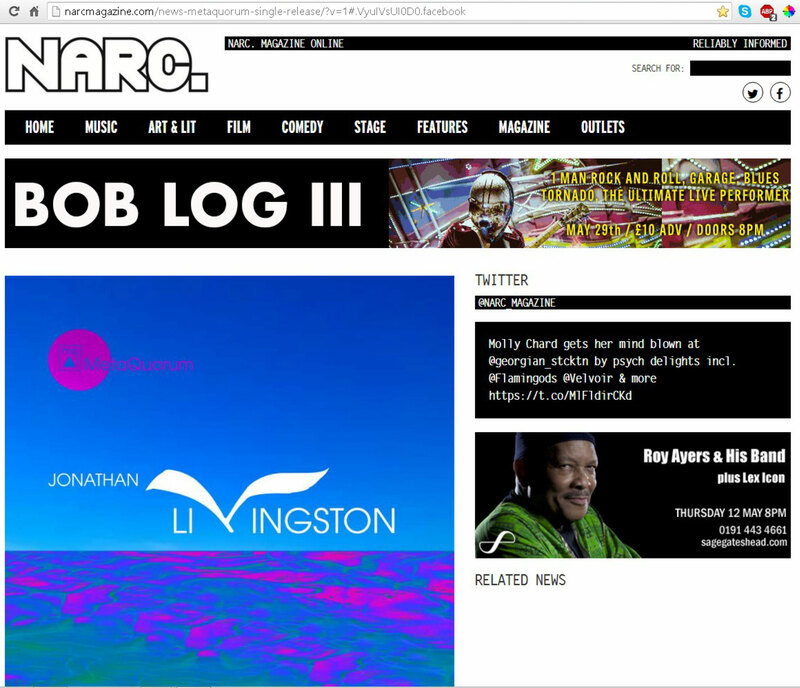 “The magical trip above is none other than the latest single from the excellent minds of two very creative musicians. Collectively known as MetaQuorum, the split sensibilities of Dmitry Ermakov and Koos Van Der Velde mix together to create something unlike we’ve heard in a very long time indeed. If ever. “If you like your music to be predictable and follow the crowd, then you should probably look away now. The single above… is about as far from the musical mainstream is it’s possible to land without dialing up Philip Glass. …Daring and atmospheric, it’s a high quality jaunt into genre-mashing mayhem, which could be a mess but is drawn together by fantastic structuring and musicianship. 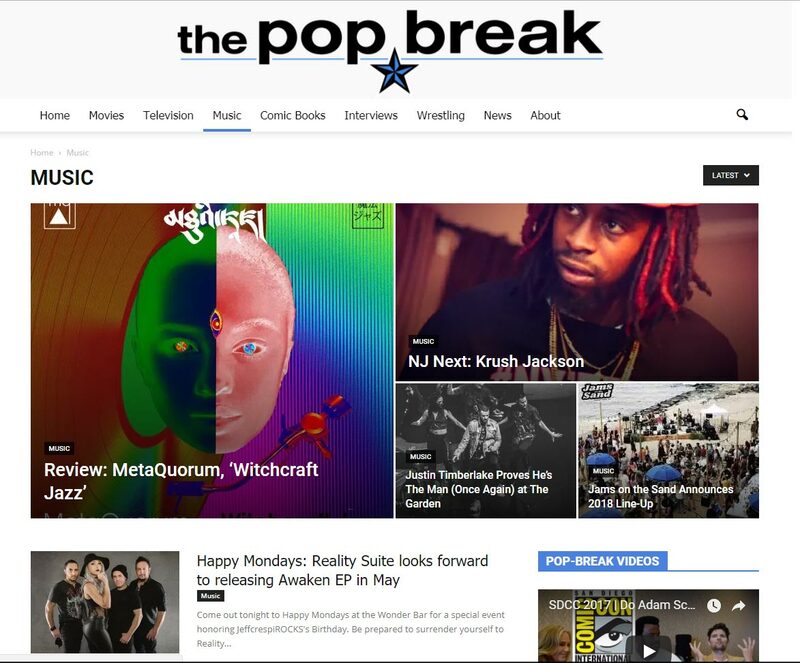 “…the new album from MetaQuorum is a real mind bender. Marrying a host of influences that you wouldn’t expect to blend, the LP is a great example of what creative minds can do when working at a high level. … this album is not for the faint of heart, nor is it for people who like to know what to expect from their music. Instead, think of it as an album for the adventurous. It’s certainly the first of its kind to have been brought to our attention this year, and it will likely be the last. “Midnight Sun definitely belongs to the electronic realm. […] The tracks are terrifically energetic, with a strong, melodic bass laid over a very robust rhythm framework, often with a funky flavour. Against this background, the keys ring out, sustained and skilful. […] If asked to come up with an overall style for Dmitry’s playing, I would say it’s a meeting of Rick Wakeman with Herbie Hancock at the time of the Headhunters. Two tracks –Midnight Sun and Unexpected Encounter – are set slightly apart; they are gentler […] kind of electronic ballads, fusion style. I sh ould highlight another track, too: Canzona. […] Dmitry Ermakov’s interpretation of the piece by Francesco Canova da Milano (or as some claim, by the amazing soviet composer-prankster V. Vavilov) is truly wonderful! It will no doubt appeal to music-lovers from Edinburgh through Zürich to Brest further East while for those in the post-soviet territories, Ermakov’s arrangement will evoke a certain mood, and they’ll be glad they heard it. By Leonid Auskeri, jazz-квадрат, http://jazzquad.ru/index.pl?act=PRODUCT&id=4042 (Feb. 18, 2015).Translated by Carol Ermakova. Editor’s Comments for Midnight Sun album title track on all-about jazz, http://media.allaboutjazz.com/jazzdownload.php?id=10119 (Feb. 4, 2015). Marc Awolin, Instructor for Piano and Improvisation, Bielefeld University & Detmold Hochschule für Musik, Germany. (November, 2014). “Designed to reflect the rough hewn beauty of North East England where the duo are based, ‘North Sea Fret’ is the debut single from Russian/Dutch born pair MetaQuorum (Dmitry Ermakov and Koos Van Der Velde). Both veteran musicians in their own right, the duo have followed quite different paths to end up in England’s North East, but they do share two vital things. First, a great love and talent for music. And second, an anti-establishment outlook. Trisicle. 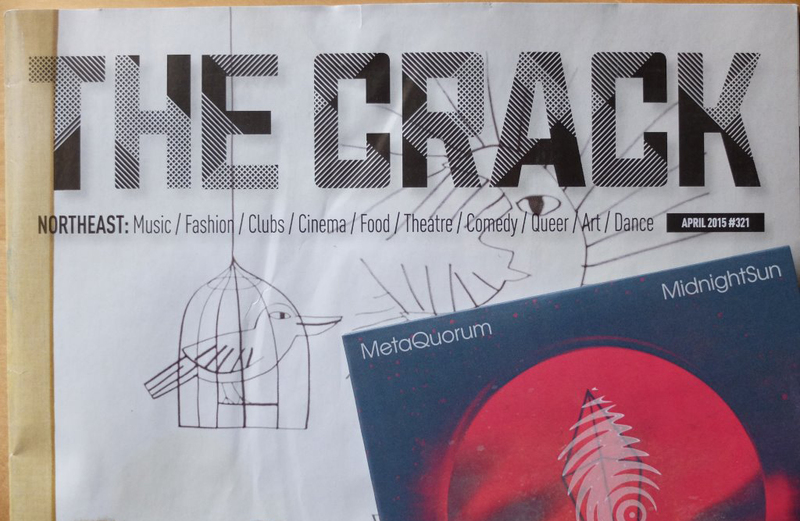 http://timbonnettdesign.co.uk/north-sea-fret-single-out-now-from-metaquorum-album-midnight-sun/ (21 August, 2015). “To be honest, I rarely listen to rock influenced music, but I really like the eclectic sound that you guys are making. I think that it has a great atmosphere, and it’s kind of a fusion of electronic music and contemporary jazz which is quite rare and sweet to my ears”. Ákos Páll Gecse, DJ, actor, video director, event manager. www.facebook.com/tonetroopers, www.facebook.com/beastoftt (October, 2014). well deserved praise — ,highlighting the great variety of styles uses to very good effect ,which is demonstrated throughout the pieces.These tracks are obviously appealing to lots of discerning and appreciative listeners.